Tamarack Lamb & Wool is the result of a lifetime of breeding sheep and building a grass-based farm in East Central Minnesota. I began raising sheep as most do, lambing in the winter indoors in a barn, feeding hay and grain. Somewhere in the late 80’s I had an epiphany moment where I realized that everyone made money on my lamb…except for me. I paid for every pound of lamb produced via purchased goods through the feed store, lumber yard, and vet supply. Also, although we are in a hay surplus area, most of that hay is lower quality “meadow hay” which is not suitable for lactating ewes and lambs in the winter and required expensive purchased protein supplementation. It was also a very labor intensive system that was hard on the body. Either I had to invest tens of thousands on mechanization, or change my approach. I took an inventory of what my “free” resources are and realized that East Central Minnesota can grow as good a grass as anywhere in the nation. Yes of course grass is not truly free, but unlike hay and grain, high quality grass does not cost me more to produce than poor quality grass, it just requires my time and management. I also quickly realized that lambing on pasture required significantly less labor than lambing in a barn because simply put, the barn created a lot of the problems we think are deficiencies in sheep maternal behavior. Unlike what we’ve been told for decades, sheep really do know how to take care of themselves, if we just give them a good environment to thrive in. It soon became clear where my competitive advantage lay. But as I moved towards a grass-based operation, I found that good genetics suitable for a pasture-based farm in the Midwest were sorely lacking. So I set out to produce a sheep that can thrive and produce a high quality carcass in a pasture-based system in the Midwest. This effort entailed pulling out all the crutches, and letting our sheep fail so I could sort the high input sheep from the ones that can do with minimal inputs. I also brought in the Ile de France breed to improve carcass quality and ability to grow on grass. Objective measurements such as recording litter size, weights, scanning for muscle and fat depth are all used in making selection decisions. Lambplan of Australia takes this information and turns it into Estimated Breeding Values to help make selection decisions more precise. Throw in a few challenges such as a growing wolf population, parasites, and at times, pastures that were less than stellar for quality or palatability, and the result is a hardy flock of Dorset x Ile de France ewes I call the Tamarack; that can lamb, and raise their lambs without any grain supplementation in a pasture-based system. 1987 I also infused the booroola gene into my flock, so that a portion of my ewes are a highly prolific breed I call the Tamarack Prolific. While my switch to a pasture-based lamb production system was based upon economics, new research on the differences in nutrient composition of grass fed vs grain fed meat stimulated consumer demand and customers began seeking out an entirely grass fed product. This caused me to double down on my commitment to producing a quality 100% grass fed product. 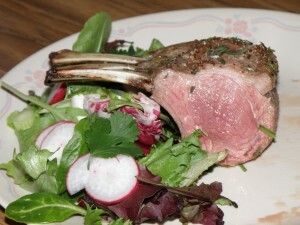 Today our grass fed lamb is known for being succulent, tender, and having a very desirable savory flavor. While many of our customers come the first time to purchase grass fed, the come back again and again for a product that is known to be tender, juicy, and above all outstanding flavor. Along the way, we learned how to deal with the growing predator population. 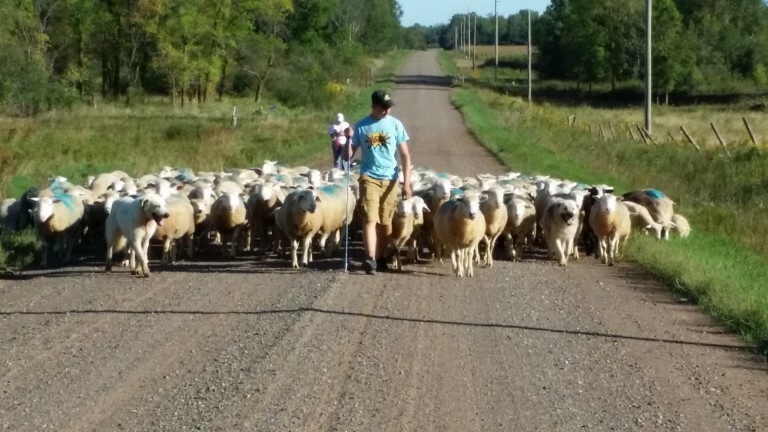 A key component to keeping our sheep safe is to maintain a population of Livestock Guarding Dogs bred to meet our demands here in Minnesota. 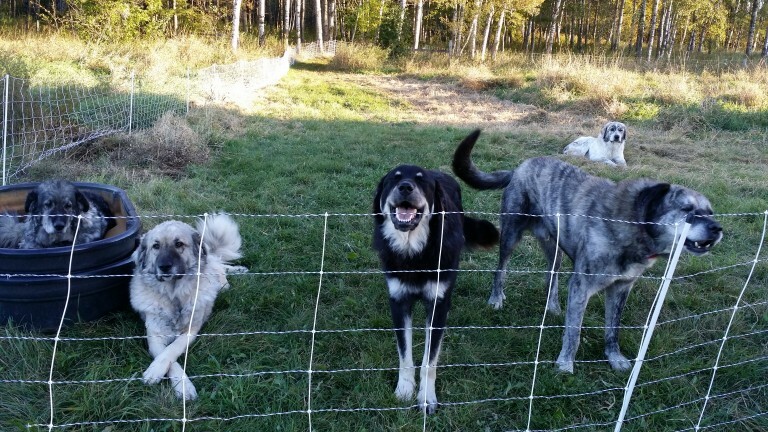 These dogs need to bond with and stay with sheep without wandering onto neighboring property. They need to be trustworthy, as often times our sheep are up to 7 miles from our homestead so we are not able to constantly supervise them. Most of all they need to be assertive enough to dissuade packs of wolves, and the occasional bear from visiting our sheep. Also, they need to be smart enough not to succumb to the antics of coyotes who can be very clever. Our current pack consists of the descendants of crosses with the Aboriginal Spanish Mastiff from Spain, with the Polish Tatra from Poland, and Maremmas sourced locally. I will hopefully be importing new genetics to add to our livestock guard dog team in the near future. I do occasionally have puppies for sale.